Gracie Mae Bradley is a human rights worker and sometime writer. She works in Liberty's policy team. Last month, 120 women began a hunger strike at Yarl’s Wood immigration detention centre, in protest at their “unfair imprisonment and racist abuse in this archaic institution in Britain”. Their demands include a 28-day time limit on detention – a long-standing goal of many campaigners – as well as amnesty for anyone who has lived in the UK for more than 10 years, and respect for the right to family life. Their demands have yet to be honoured by the Government. Since their inception, these centres have been beset by sporadic scandal, from the near-sinking of a ferry converted into a makeshift detention centre holding Sri Lankan refugees in 1987, to the virginity testing of Indian and Pakistani women at Harmondsworth under a Labour Government in the 70s. Only two weeks ago, it was reported that a coach carrying migrants from detention to a deportation flight had caught fire, with guards handcuffing people before they were allowed to disembark. Opened in 2001 by a David Blunkett-run Home Office obsessed with rooting out “abuse” of the asylum system, Yarl’s Wood is one of nine immigration prisons in the UK. It once had the capacity to hold 1,000 people, but that now stands somewhere around 400, after a riot in 2002 reduced it to “smoking ruins”. In 1993 the UK’s immigration detention estate had the capacity to hold 250 people at any given time. Today its capacity is 4,000, with approximately 30,000 people locked up on immigration grounds each year – some of them in mainstream prisons after serving custodial sentences. Most detention centres are privately run: something to be noted not because publicly run immigration prisons would be better, but because the role of private industry and the profit motive in opposing reductionist or even abolitionist policy cannot be overlooked. In theory, people are held in immigration prisons at the Home Office’s discretion to facilitate their removal from the country. In practice, the majority are released back into the community after months (and in some cases years) of detention. One could ask why, in that event, they were ever detained in the first place. But one could also note that it was as far back as the 1980s that the Home Office began to speak about immigration detention explicitly in terms of deterrence. 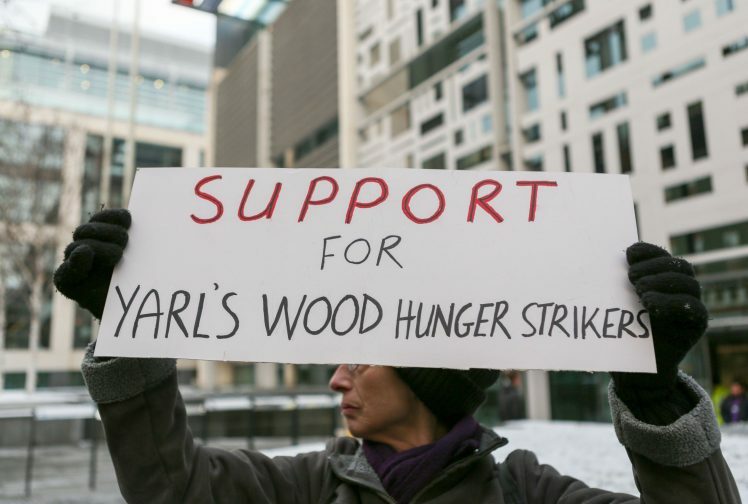 As Mishka Pillay wrote very recently, the hunger strikes at Yarl’s Wood are part of a tradition whose ongoing necessity shames us all. In 2013, a close friend of mine, KS, embarked on a hunger strike to protest his unjust detention and separation from his one-year-old daughter, whom he had never met. He did not want to stay in the UK. And yet the Home Office refused to release him, so he remained on hunger strike for 56 days. KS was freed by a sympathetic judge on a good day, and not long afterwards I received a message from him from elsewhere in Europe, where he is now together with his daughter. To this day he maintains that he will “never believe what they did” to him. After KS disappeared following his release from detention, the Home Office’s stance on hunger strikers in immigration prisons hardened even further under the direction of Theresa May. Some will remember the case of Isa Muazu, a Nigerian man with severe mental illness who had fled Boko Haram and sought asylum as a refugee in the UK after overstaying his visa, only to see that claim refused. Up until then, it had been relatively common that a person who embarked on a hunger strike would be released. By the time Isa Muazu was on hunger strike, ministerial sign-off was required for release. And rather than release him, Theresa May put an ‘end of life’ plan in place for him and chartered a private jet to fly him back to Nigeria on a stretcher, because by that time he was too unwell to walk. I do not know what became of him. Now, people on hunger strike receive letters from the Home Office explicitly threatening that their protest could accelerate their deportation. The deportation of at least two Yarl’s Wood protestors, Florence and Opelo Kgari, has been temporarily halted following intervention from their MP. The detention of migrants must be viewed in the context of the criminalisation of immigration by the British state. Two years after Enoch Powell made his “Rivers of Blood” speech in Birmingham, Reginald Maudling, Conservative Home Secretary, introduced the Bill that would become the 1971 Immigration Act. Maudling maintained Powell’s framing of immigration as a problem of community relations, while trying to reassure the House that “in this country there will be no first and second-class citizens”. When the 1971 Act came into force in 1973, it created a new liability to detention on immigration grounds and a series of criminal offences for breaching immigration law. It also granted leave to remain to everyone who had settled in the UK prior to then. All that many people – including thousands of immigrants from Britain’s former colonies – received at that time to prove it was a stamp in their passport. Over five decades later, many of the stamped passports of those who arrived in the 60s and 70s have been unsurprisingly lost forever. Thus older Commonwealth citizens who were granted leave under the 1971 Act, but who are unable to prove it, now find themselves in the position of undocumented migrants: barred from public services, work or housing and liable to immigration enforcement and detention, flagged up to the Home Office through routine employment and benefits checks. One could add to that group the people entitled to British citizenship who have been priced out of registration by exorbitant fees (over half of which is, in the cases of child applicants, profit to the Home Office), people from the EU who have been rounded up for sleeping rough or otherwise not “exercising their treaty rights”, plus other undocumented people who have fallen foul of the immigration system because they’ve been unable to access legal aid or keep up with rapidly changing rules. In this way, the picture of who ends up in immigration detention extends far beyond asylum-seeking women in Yarl’s Wood. Former Immigration Minister Brandon Lewis very recently caused a minor furore when he stated, falsely, on national television that asylum seekers are not held in immigration detention. While it is of course important that ministers are not able to mislead the public unchallenged, the ensuing calls for apology and correction cannot be our only demand. It might be tempting to reframe immigration detention purely as a harm that befalls particularly vulnerable asylum seekers to whom we owe a moral duty. That isn’t incorrect, but it does miss something very important. The fundamental point that the Government must be made to understand, is that no one, whatever their reason for coming to the UK, should be deprived of their right to liberty for the convenience of the Home Office. Under the auspices of its “hostile environment” policy, the Government now operates a vast data sharing and matching system that sees information shared between the Home Office and schools, hospitals, Jobcentres, banks, police, employers, landlords and homelessness charities for immigration enforcement purposes, in some cases without the knowledge of data controllers or subjects. State capacity to abuse the rights of migrants will only intensify over the coming years. Right now, the House of Commons is debating a so-called Data Protection Bill that will strip people of rights on immigration grounds, paving the way for a digitised, automated system of internal immigration controls that excludes undocumented people from access to health, education, housing or work, and increases surveillance of us all. The proliferation of biometric technologies like facial recognition and fingerprint scanning will only enable further encroachment on the privacy rights of each of us in the name of immigration control. Whether non-citizens are entitled to the basic goods and services necessary to live a dignified life raises an urgent question about what kind of society we want to live in. From their very inception, immigration detention and the hostile environment have typified a logic of dehumanisation – a logic which, as Nisha Kapoor notes in Deport, Deprive, Extradite, both denies access to fundamental rights that would be available to those recognised as fully human, and sanctions harsher punishment by the State for perceived transgressions than would be meted out to others. It is for this reason that any remedy for the abuses experienced by people locked up in immigration detention or targeted by other exclusionary hostile environment measures must rely on more than a claim to citizenship, or by analogy, to sanctuary or leave to remain, in order to succeed. Kapoor sets out that “[w]hile citizenship provides a conduit through which calls for rights and political recognition are given legitimacy […] the same forms of state violence being opposed remain defensible when applied towards those subjects outside of the nation’s boundaries, whether residing outside of the nation, in this context the UK, or as an internal denizen marked as an outsider”. While a move from sanctuary or citizenship-based appeals towards demands in terms of genuinely universal human rights may prove more successful, we cannot forget that even these demands rest on a prior claim that is clearly contested by the State – that migrants are indeed fully human. You can follow updates from people on hunger strike at #HungerforFreedom, @detainedvoices and @sdetsup. You can support Liberty’s campaign to end indefinite detention here.